~ New design. Four boats already in build by April 2014. The Didi 950 is the newest boat in our range of radius chine plywood designs and has been drawn to fit into the Class 950 box rule. This is a level class rule for short-handed offshore racing that produces a strong boat of reasonable proportions. This also makes it a rather nice performance cruiser suitable for two couples or a small family. All structural drawings are done and ready for builders to start. Steering and some minor detailing is still in progress and will be supplied to builders when ready. Kits are already available in USA. 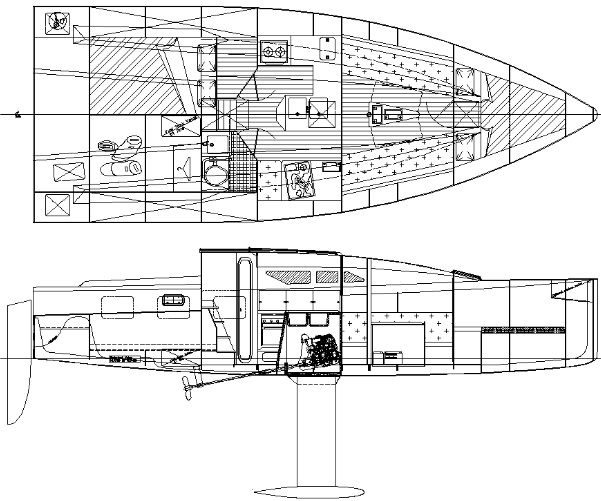 The interior layout shown is the first one drawn, with aft heads and the sleeping cabins separated for good privacy. There will also be an alternative with the heads moved into the forepeak and mirrored double aft cabins. It will be drawn when someone wants that layout. This is a good seaworthy interior, safe in rough seas. It is set out around the central engine location, under the centre galley unit. This places the engine over the top of the keel and close to the centre of pitch, for reduced pitching and improved performance in waves. It also allows a very snug U-shape galley where the cook has plenty to brace against and can jump out of the way quickly, without any need to be strapped in. The galley counters house lots of storage as well as a large icebox or freezer. The settees in the saloon serve as additional sea berths. The spaces under the seats house integral water tankage that can be the 100 litre minimum required by the Class 950 Rule or can be as much as 400 litres if all of the space is used for tanks. Outboard of the backrests are shallow cave lockers. The base of the saloon table houses two 100ah batteries and an optional third battery can be placed under the nav table. The nav table is large for this size boat and proportioned so that it can be used either seated facing forward or standing facing outboard. The aft berth is 2.13m (7ft) long to suit the tall client who commissioned the design. Outboard of it are deep cave lockers above the water ballast tanks. The heads on starboard has a wet locker aft of the WC, convenient to the companionway for wet foul weather gear. Ballast water tanks are 450 litres each side of the boat and span the length of the aft cabin. They are placed low in the boat where they will be of maximum benefit for righting from a knock-down situation, whether knocked down to leeward or to windward. Aft is a large lazarette that can be accessed from the aft berth or through a hatch in the starboard cockpit seat. In the quarters are a gas locker to port and a liferaft locker to starboard, accessed through flush deck hatches. Both are vented and drained through the transom. 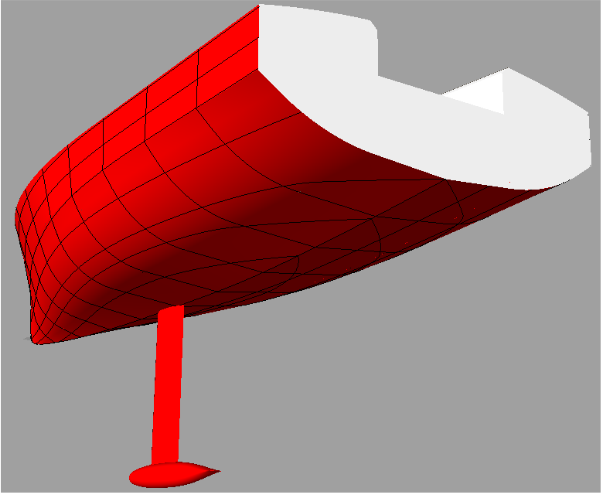 Hull shape is radius chine with a partial hard chine in the topsides. The radius chine runs from the transom through to the forefoot and produces a shape close to round bilge, with a shallow v-bottom. The hard chine runs from the transom through to the mast, where it fairs out into the topsides. 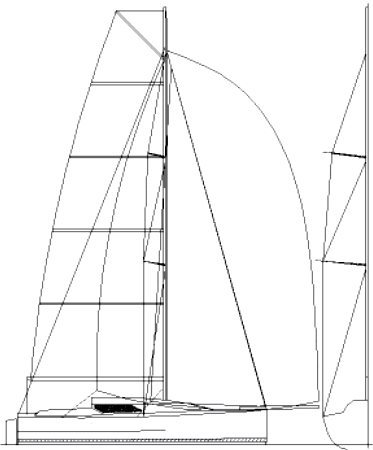 The resulting shape is fine in the bow, with a broad, clean and powerful stern. Low drag and fine bow for wave penetration and upwind sailing, powerful aft for planing downwind in the strong stuff. 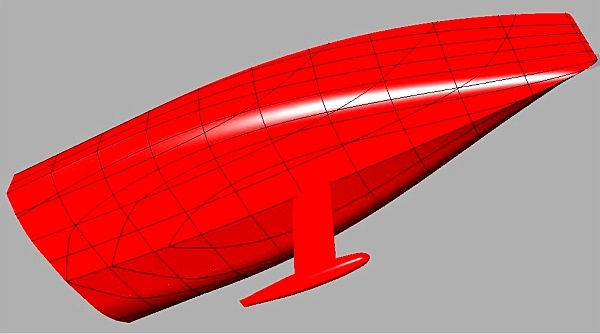 The images below have the section, buttock and waterline shapes included, to show the hull shape more clearly. 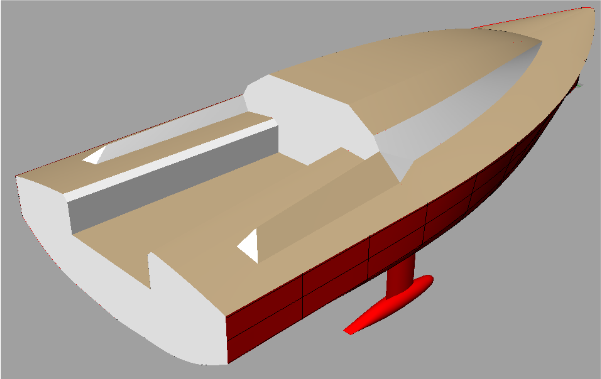 The deck configuration uses stitch & glue construction methods for cabin and cockpit details. This gives simple and speedy construction along with a pleasing appearance. It also gives a cleaner interior, with less longitudinal framing. Cockpit coamings are shaped to form a backrest and cubby holes for sandwiches, winch handles etc. The top is shaped to be a comfortable seat for helming on the weather rail. Detailing is based on the series of radius chine plywood designs that started with my DIDI 38 "Black Cat", and was followed by a string of designs through to the Didi Mini Mk3. Construction is with sheet plywood panels to hull sides and bottom as well as all of the deck and superstructure. The hull radius is done in two layers. All of the skin is 9mm thick, designed to exceed the requirements of ABS Offshore Yacht Rules.The hull can be skinned with 12mm as an option for increased strength for cruising. The keel is a hollow steel fabrication with through-bolted beaver tail ballast bulb. It is bolted through the hull to a steel support box on the inside and which is bolted laterally and fore/aft to glass reinforced plywood backbone and bulkhead components. This support box also incorporates the engine beds and bearers, for a strong and compact structural unit. 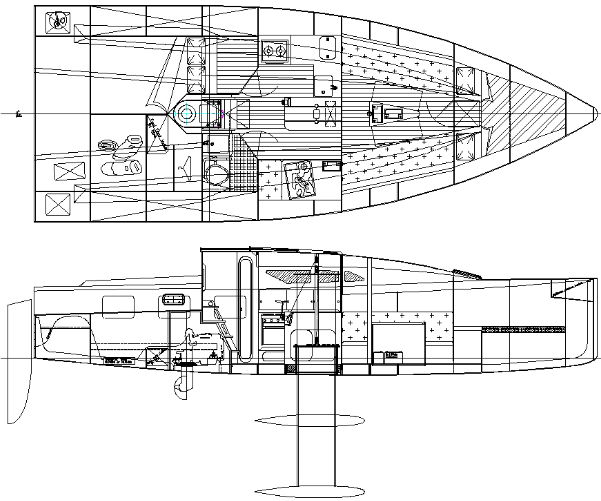 The loads of keel and engine are ditributed laterally through the bulkheads and floors as well as fore/aft through the backbone components. These members also tie into the mast support structure. Linked twin rudders are steered by central tiller. We also have a lifting keel alternative that reduces the depth to 1.15m (3'9") for access to shallow moorings or anchorages. It uses the same internal structure as the fixed keel version but the shaft-drive motor under the galley counter is swopped for a sail-drive motor under the companionway. A fabricated steel casing replaces the combined keel support and engine beds of the fixed keel version. The lifting keel locks down for sailing and is raised through the central galley counter by a tackle and winch. 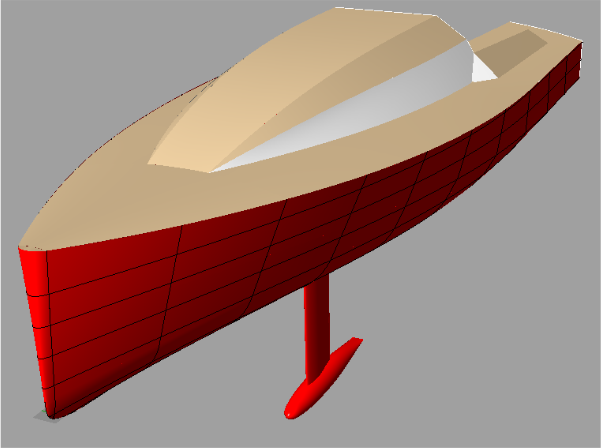 In the raised position the keel is 50mm (2") below the rudders. Didi 950 Accommodation with lifting keel. The deck layout is a fairly conventional 4-winch arrangement. All halliard and reefing lines are led to the two cabin roof winches. All headsail and asymmetrical spinnaker sheets are led to the winches on the cockpit coamings. Spars can be either carbon for performance or aluminum for reduced cost. Drawings include full size Mylar patterns of the backbone, bulb & rudders. Optional full size Mylar patterns for the bulkheads are also available. For pre-cut hull, deck and bulkhead kits in USA go to our USA kits page. Kits will also be available from suppliers in other countries; click here for supplier contact info. Please clarify with suppliers what is included in their prices. Figures shown are with aluminium spars. This design is dimensioned in both metric and imperial measurement systems.